Well, this card has a story behind it! Around Christmas I found this site that was selling this funny DVD about a guy dressed in drag, being a scrapolic. I had to have it and besides part of the proceeds went to help Autism research. So I took it to my month scrap meeting and we all laughed so hard we had side aches. Well a couple of weeks ago I found that they just made their own stamp set also, so I had to have it to complete my set. This card went out to Tammy, one of the best scrappers around! She has so much inspiration and always has encouraging words. 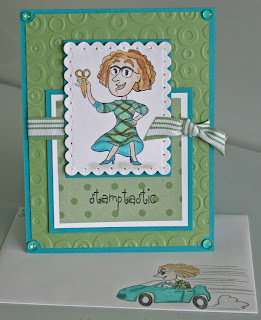 I used the color challenge on Splitcoast for this card, it is Taken with Teal and Wild Wasabi. I stamped Molly with my Brillance Black and colored her with Prismacolors and gamsol, I cut it out with the Nestibilites and pierced the scallops. The background of course if Cuttlebugged. For the finishing touches I added the Wild Wasabi Striped Ribbon and Dew Drops.